Hey there, folks! I had some things that needed to be taken care of yesterday, so I did not post a pack break. Today, I'm posting two packs to catch us up again! 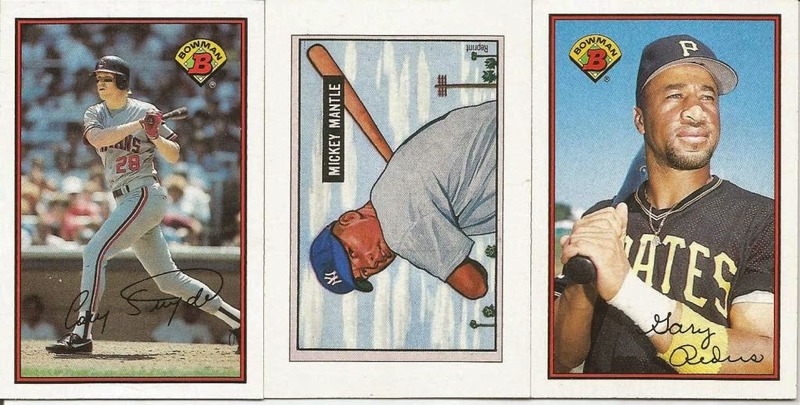 We're going to start with 1989 Bowman "Comeback Edition" cards. Back then, this was a big deal. 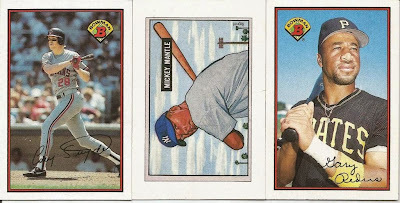 Topps had brought back one of the "original" baseball card brands and in the larger format. I was two years beyond high school at the time, and I can remember how excited I was. Let's get rippin! Wow! Three Indians cards in one pack! Man, I should have been playing Tribe-or-no-Tribe. Congratulations to you managers that got a player here. We're adding more and more folks to the free agent pool, which is okay by me. *The Redus card had 1989 gum that had been stuck to it. The back is pretty rough from where the gum had been stuck and subsequently fallen off. *Remember, these 1991 UD packs were opened and repacked from Nachos Grande. Do not expect off-the-shelf numbers or collation. Do, however, expect cardboard fun! David, All the packs i sent your way were sealed (to the best of my knowledge) - other than the custom mini packs of course. If any of the packs were opened and resealed it occurred sometime before I gained custody of the packs! Whoa! Well *ALL* the packs are opened and presumably searched. That is too weird!